Saber Saw or Grinder, or Saws All or Cut off Saw - (Fine tooth blade for saber saw) Know your tools and your Tub material before deciding. 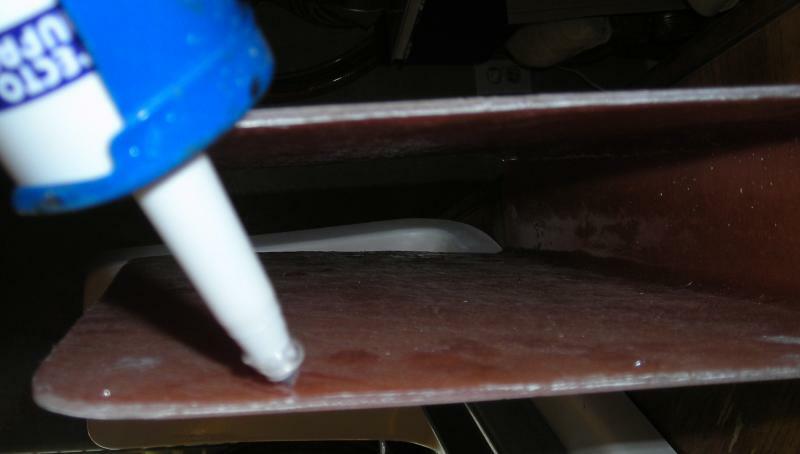 Waterproof Silicone Adhesive - we recommend using and Aquarium silicone. 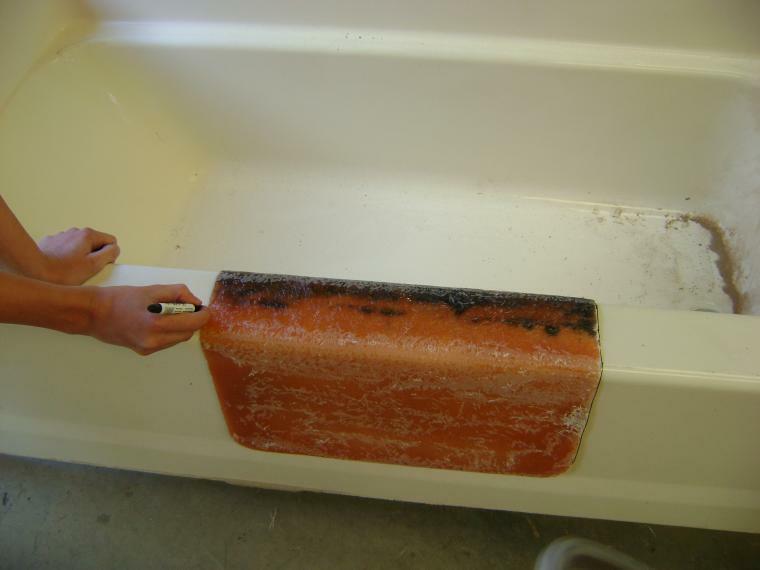 WITH A BLACK FELT MARKER, TRACE AROUND THE TEMPLATE ONTO THE BATHTUB, STAYING AS CLOSE TO TEMPLATE AS POSSIBLE. THIS WILL BE THE MARKING FOR YOU TO CUT THE BATHTUB OUT FOR THE INSERT. 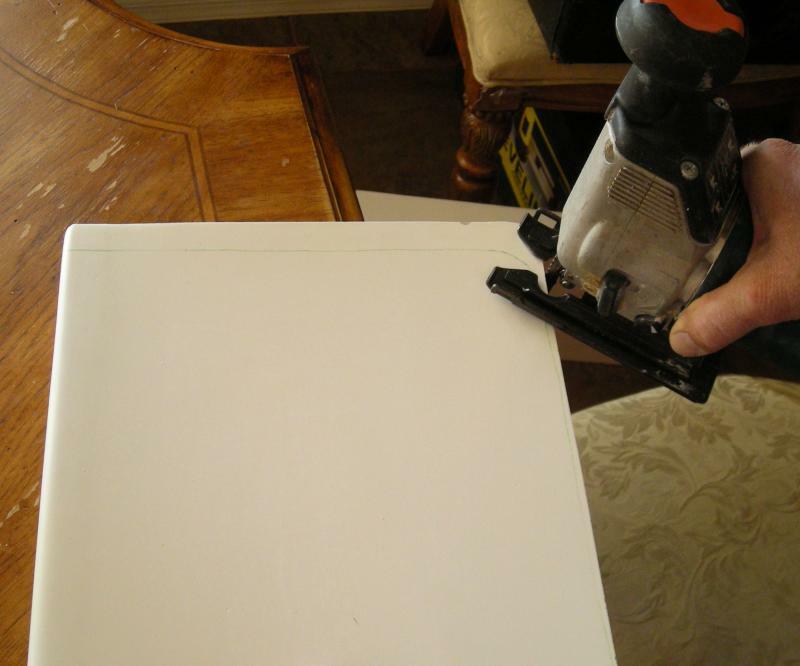 REMOVE THE TEMPLATE, BUT DON’T TOSS.. SAVE IN EVENT THERE IS A PROBLEM WITH THE INSERT PIECE. Wear dust mask, FIRST DRILL A HOLE ON EDGE OF BLACK MARKED LINE AT TOP OF TUB SIDE. 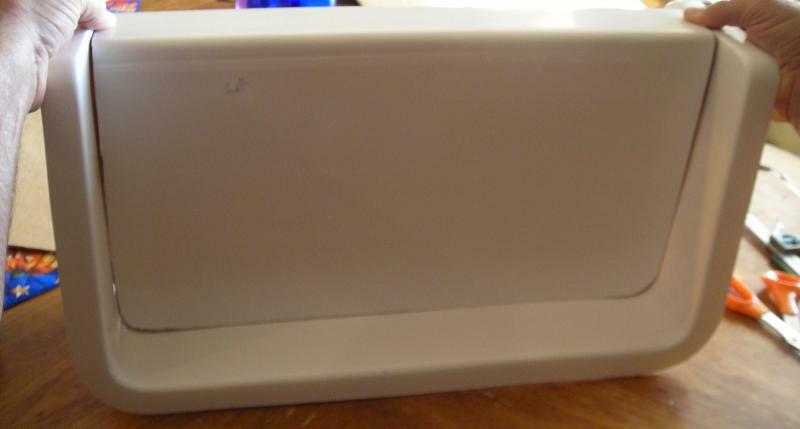 THEN TAKE SOME TYPE OF ELECTRIC SAW, SUCH AS A SABER SAW AND CUT THE BATHTUB OUT ALONG THE LINE YOU JUST MARKED, TAKING CARE NOT TO GO OUTSIDE THE LINE. CLEAN UP ANY DEBRIS AT THIS TIME. Save the piece you cut out until saddle is installed. 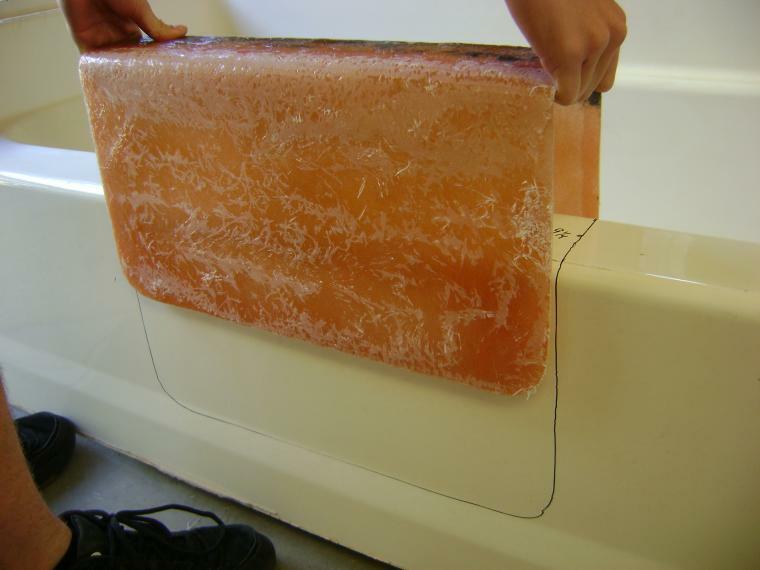 NOTE: IF BATHTUB IS METAL WITH PORCELAIN OVERLAY, USE MASKING TAPE ALONE EDGE OF WHERE YOU NEED TO CUT TO MINIMIZE CHIPPING OF THE PORCELAIN. 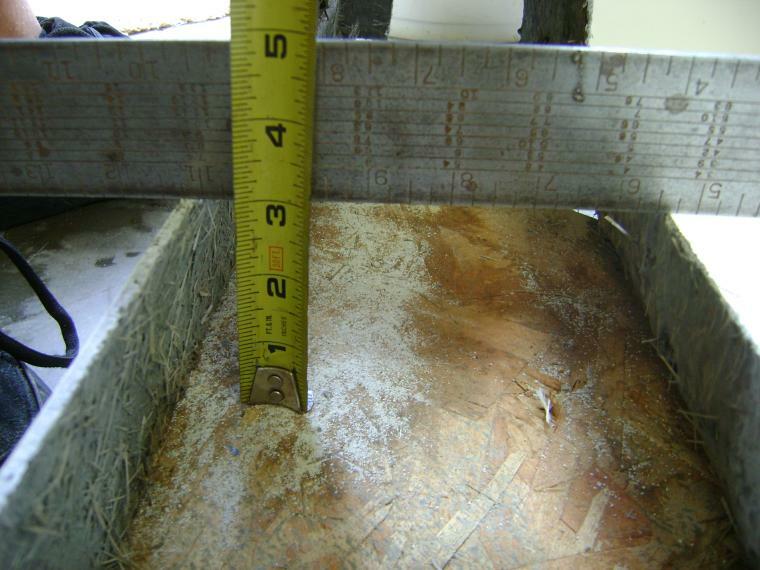 YOU MAY NEED TO PLACE SOME 2X4 WOOD AND WOOD SHIMS IN THE BOTTOM OPENING OF THE EXPOSED BATHTUB TO GIVE SUPPORT TO THE BATHTUB BOTTOM PART OF INSERT. YOU CAN USE CONSTRUCTION ADHESIVE TO KEEP THESE IN PLACE, DO SO NOW IF NEEDED. 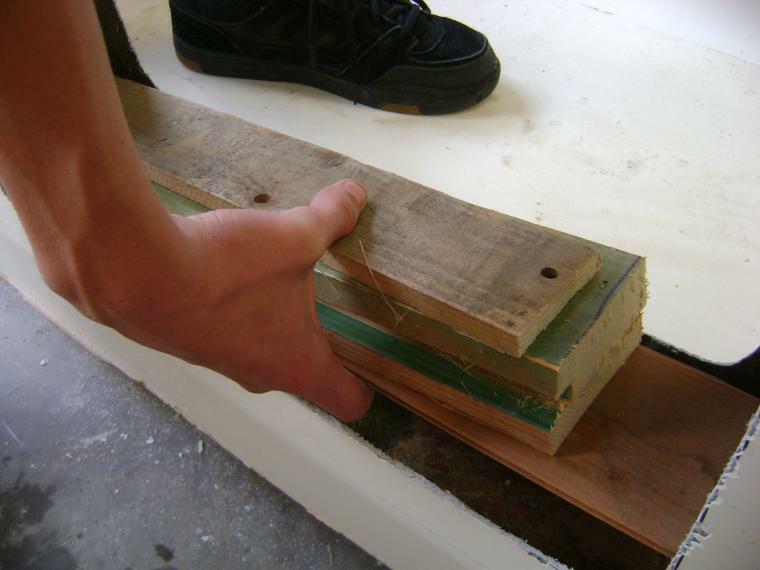 SO FIRST MEASURE HOW DEEP OPENING IS THEN PLACE APPROPRIATE AMOUNT OF WOOD THERE FOR SUPPORT. 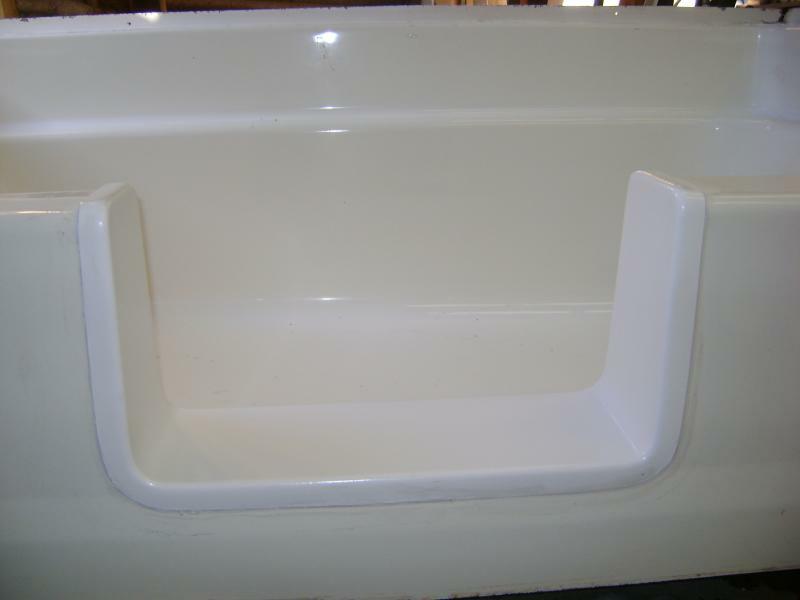 PLACE THE INSERT IN THE CUT OUT SPACE TO VERIFY THAT IT FITS, YOU MAY NEED TO WIDEN THE BOTTOM OF THE TUB WITH A 2X4 PIECE OF WOOD OR TIGHTEN THIS FIT WITH THE SAME PIECE OF WOOD BY SCREWING IT TO THE INSIDE OF THE CUTOUT SPACE AND PULLING IT TOGETHER, IF YOU HAVE PROBLEMS WITH THIS CALL US FOR INSTRUCTIONS. 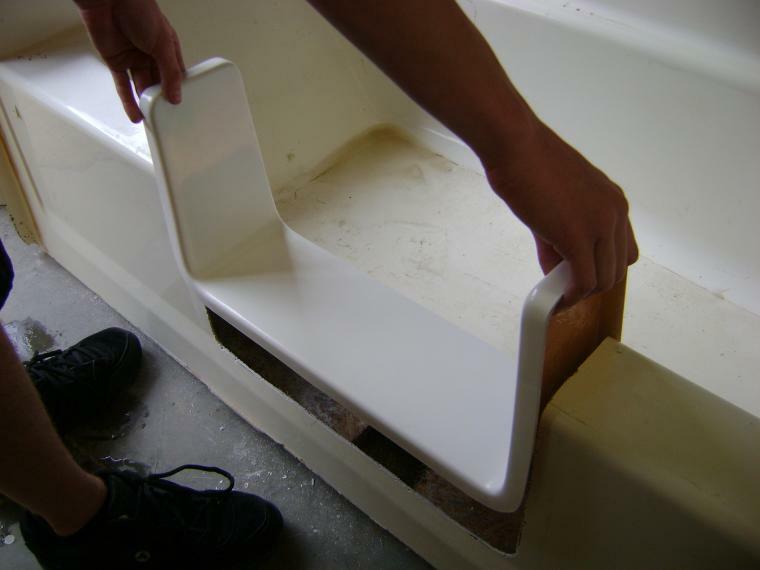 APPLY WATERPROF SILICONE ADHESIVE TO THE UNDERSIDE OF THE INSERT ALONG THE EDGES THAT WILL TOUCH THE BATHTUB. 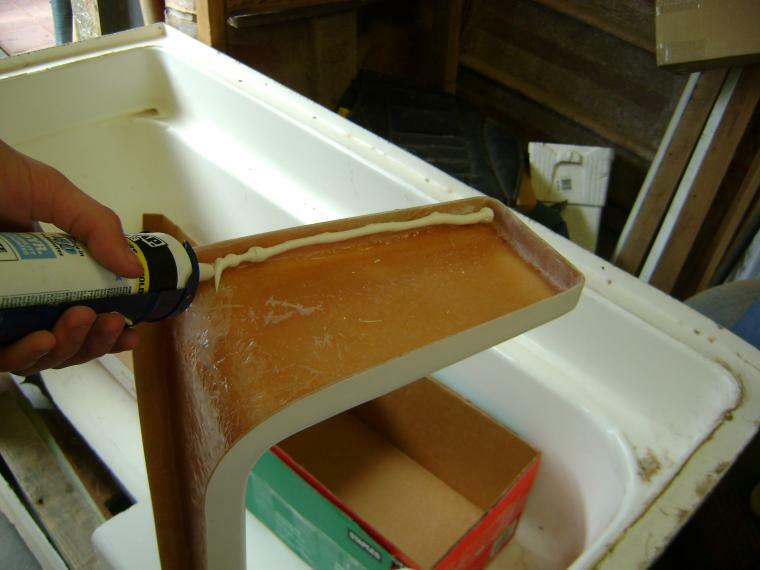 FOLLOW INSTRUCTIONS ON THE ADHESIVE TUBE FOR APPLYING..
SET THE BATHTUB INSERT IN PLACE. 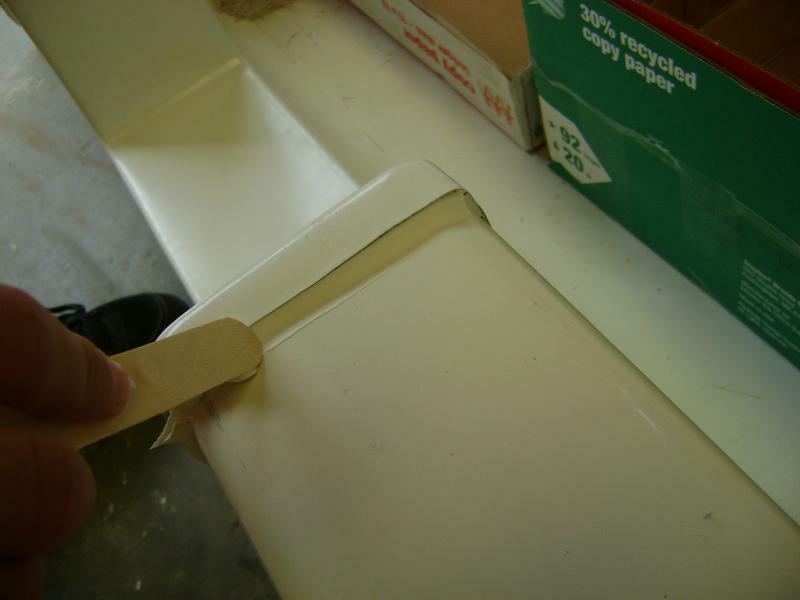 USE A POPSICLE STICK TO SMOOTH THE ADHESIVE THAT SQUEEZES OUT OF THE INSERT AND IS EXPOSED. 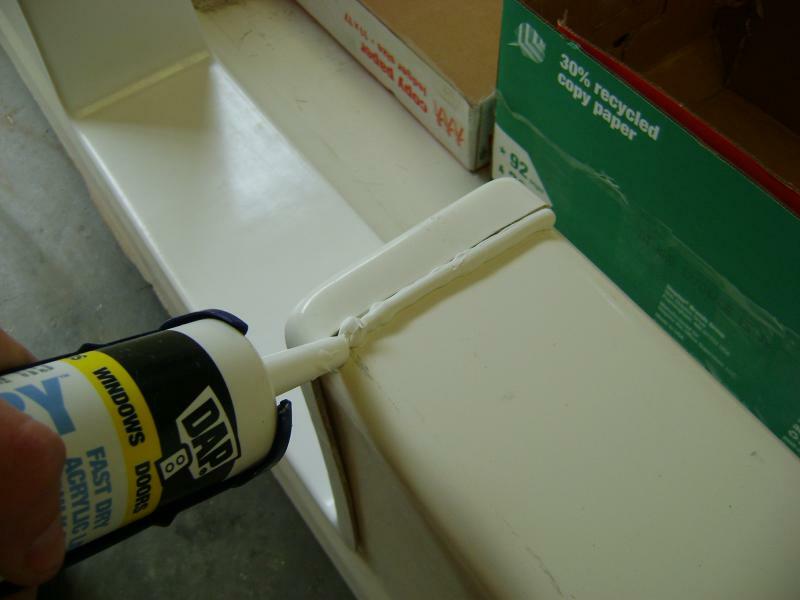 YOU CAN NOW APPLY ANY CALKING THAT YOU WISH OR YOU CAN USE THE ADHESIVE AS A CALKING ALSO. CLICK ON PICTURES TO ENLARGE. PICTURES ARE IN ORDER OF INSTRUCTIONS. Installing Bathtub Saddle Pictures on Left. 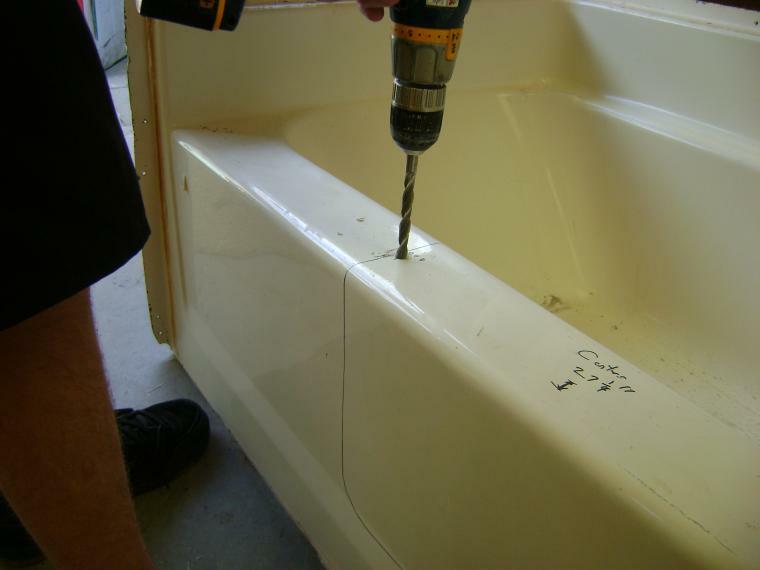 Installing Bathtub Reversal Part Pictures on Right below their individual instructions. *** - Caution Pre-Drilled Rails have Sharp edges. May cause Cuts, Wear Leather Gloves when handling. Make a Cardboard template. 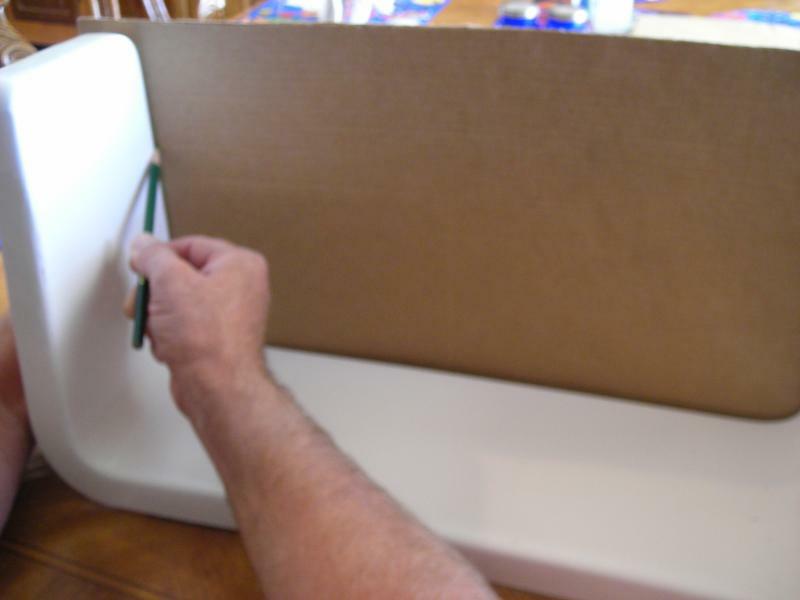 Hold a piece of cardboard on the inside of the tub and draw outline of insert on the cardboard. 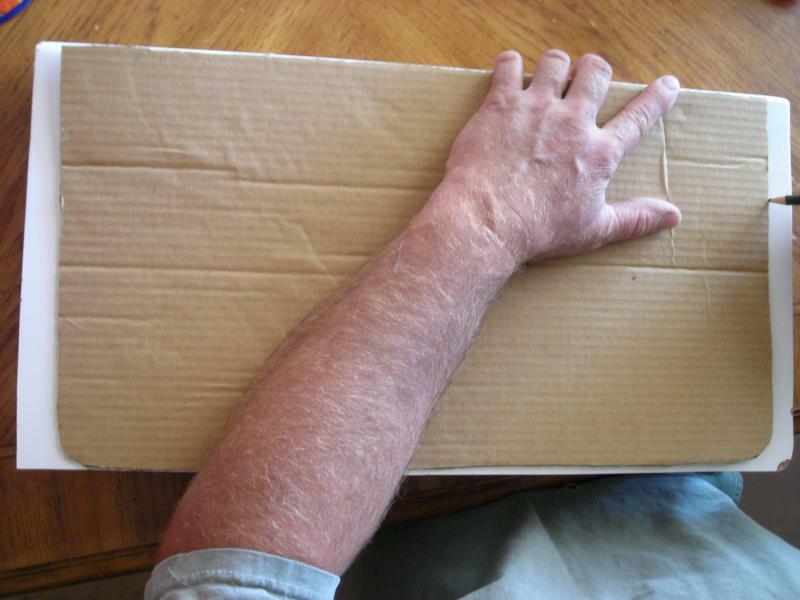 Mark the cardboard, with Top, Bottom, Left, Right, Inside, Outside. This will be important later on. Cut the cardboard piece along the line drawn. 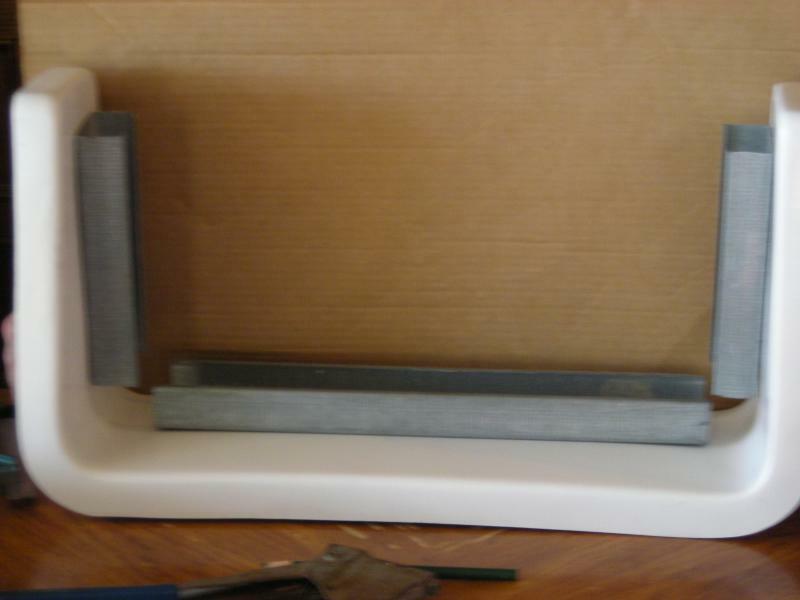 Set Cardboard Template on the Reversal Piece. Draw a Line on the Reversal Piece. Be sure to flip mark the piece on the top and reverse side. This is where the Top/bottom, etc. comes in handy. 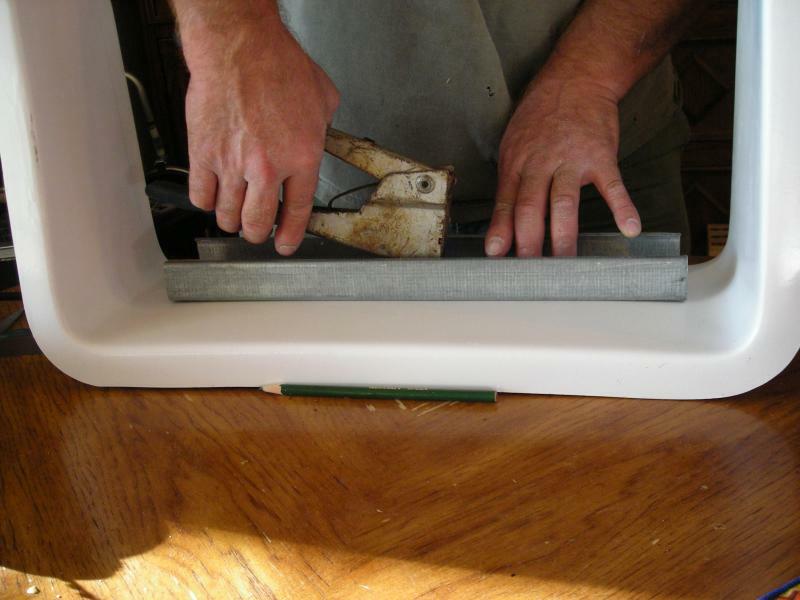 Use a short fine tooth blade on a saber saw and cut out the reversal piece on the markings you made in step 2. 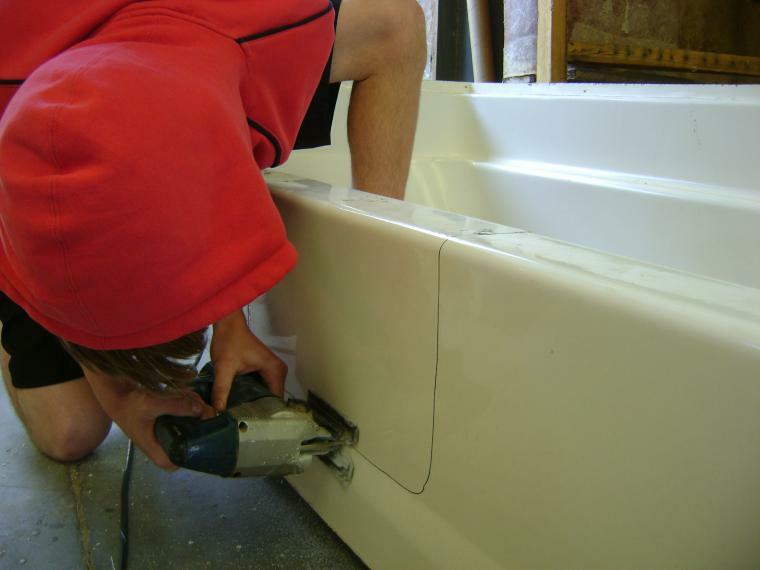 After Cutting out the Bathtub Reversal Piece, do a test fit. Installing the Rails. While test fitting the reversal piece inside the saddle, draw a line (with pencil ) along one side of the saddle along side and bottom to mark where the reversal is to fit. (holding pencil along the side of the reversal) NO PICTURE FOR THIS STEP. Line up rail with the pencil line. Using a 1/8” Drill Bit hold the rail and drill thru the 6 predrilled holes on the bottom rail and the 4 predrilled holes on each of the side rails into the bathtub insert. You will need to be very accurate with these holes so that they line up later. Take caution when handling Rails as they can be sharp and cause injury. 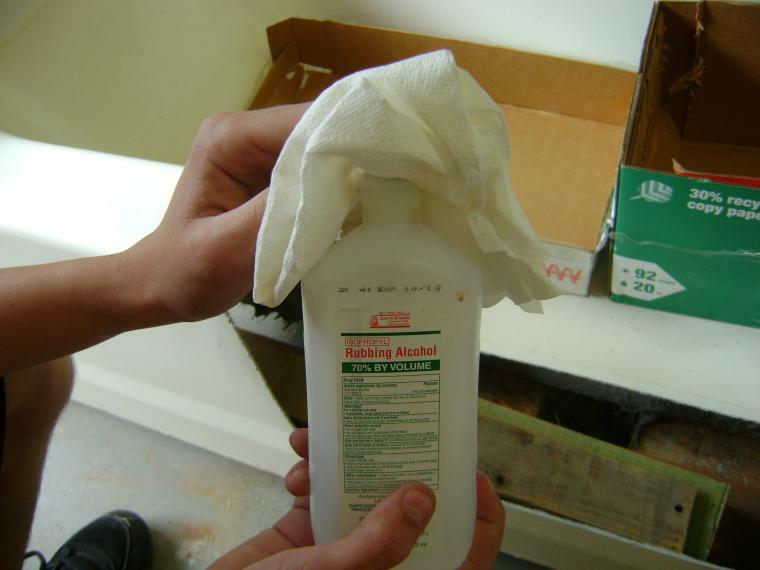 Before using any silicone clean all surfaces that will come in contact with the silicone with rubbing alcohol, this will prevent leakage of the silicone and help the parts to adhere better. 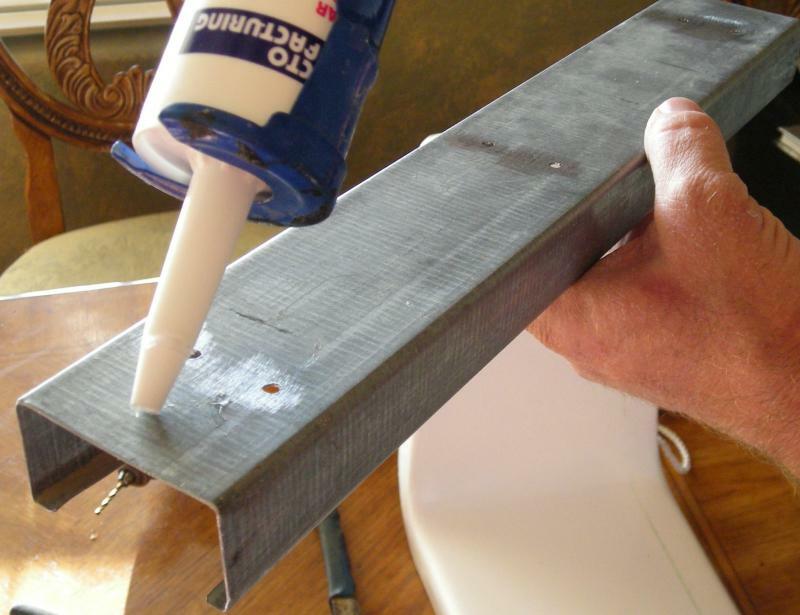 After drilling the holes, apply a few lines of high quality silicone along the bottom of the galvanized rails. 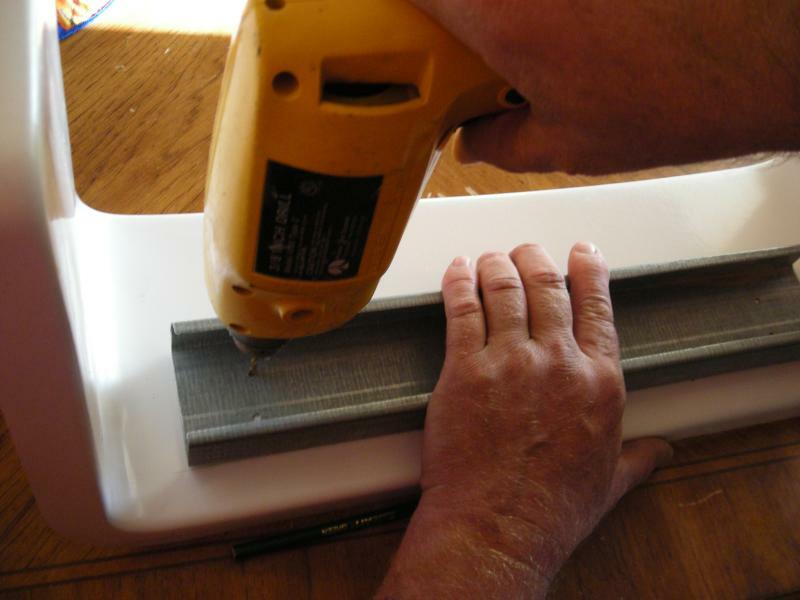 While the silicone is wet, line the rails up with the holes you drilled on the insert. After lining up the rails pop rivet the rails in place. All rails should be even with the lines you drew earlier. Do one final test fit of the reversal piece over the rails before continuing on to step 9. 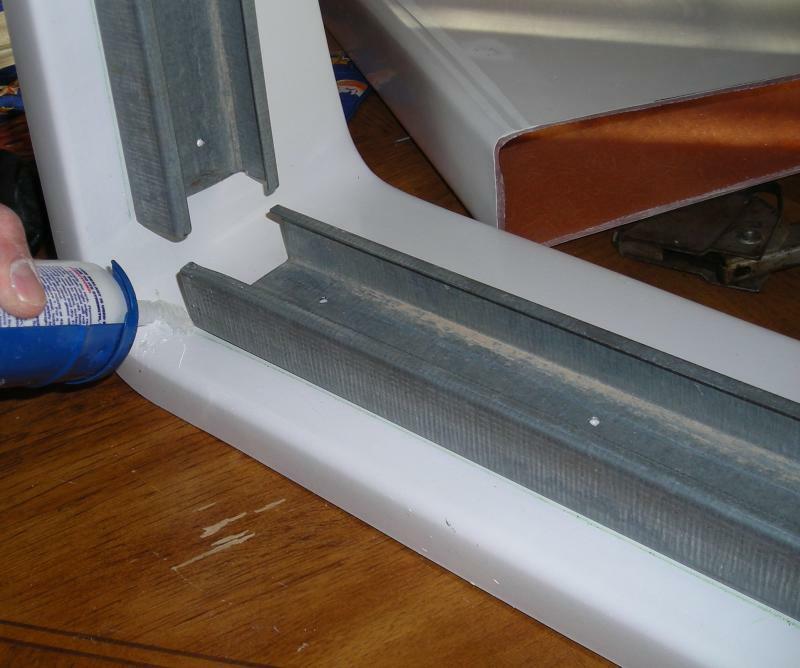 Now that the railing is in place, Install a good quantity of Silicone where the rail meets the insert, along the rail and between the rails along the line previously drawn. 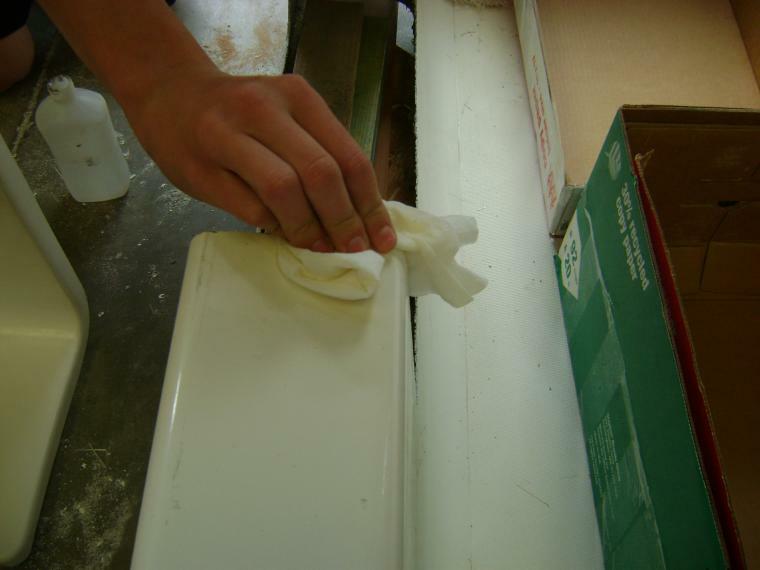 Install a line of silicone on the inside edges of the reversal piece. Take the reversal piece and spread apart so that you can slide it over the rails. Let the piece sit for 24 hours for silicone to completely dry. 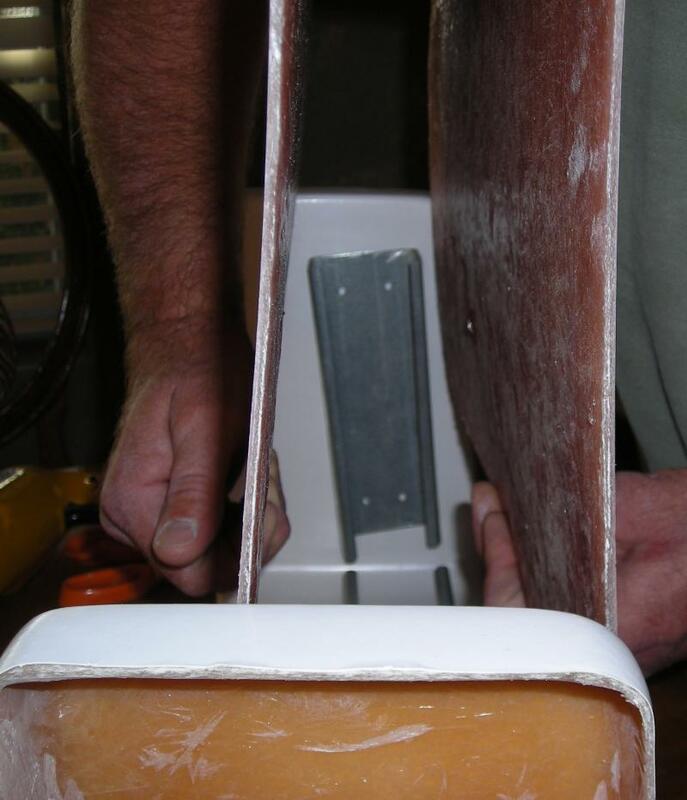 After dry then apply calking on outside of both sides of reversal part for a finished look. This is a Do-It-Yourself Project. Know your tools before you start this or any project. Take your time and be Safe!!!! 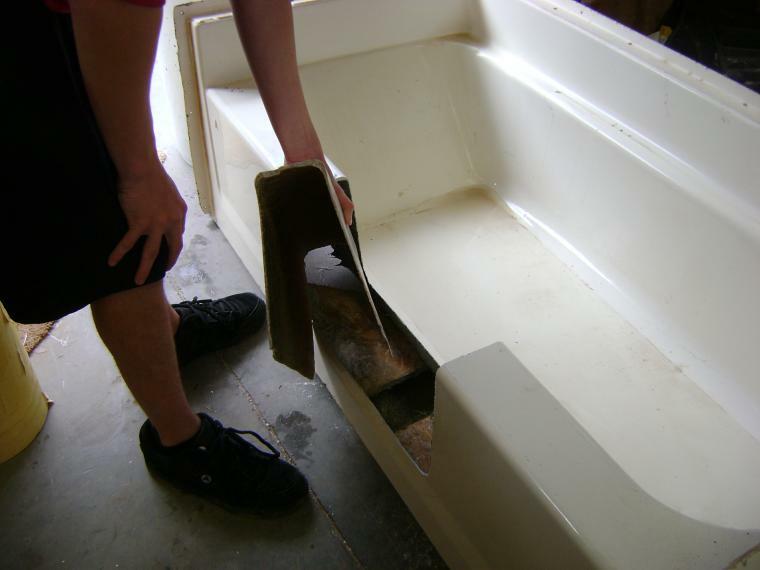 Metal tubs are more difficult than fiberglass tubs to cut, Use a drill to determine the thickness of tub before cutting, then decide which tool to use to cut into the tub. The thicker the metal, the longer it will take to cut out. We can not be responsible for using the wrong tools, or for making an incorrect cut. 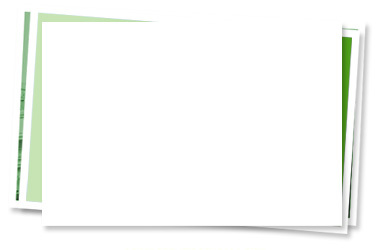 We Provide the part and basic instructions for installation only. We warranty our part only. 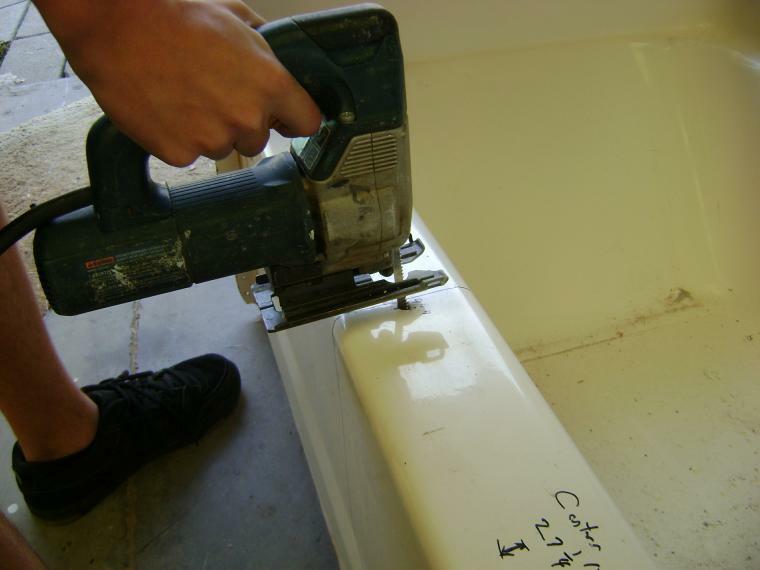 If unsure of how to cut the tub or how to use your tools be sure to contact someone locally that can help you with that.